Adventure Island has something for everyone! Whether your idea of water play is serene or extreme, you'll find it on the state-of-the-art rides and slides -- you just need to find one that's your speed! 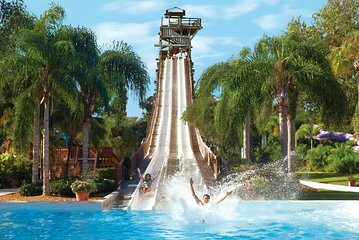 Enjoy slides, pools, kid-friendly attractions and fun in the sand. For additional fun, choose from combo ticket options with SeaWorld Orlando, Busch Gardens Tampa or Adventure Island Tampa. Upgrade to include unlimited visits and parking! Venture into the amazing world of the ocean and its inhabitants as SeaWorld® Orlando takes you on an unforgettable journey into the deep. With various up-close encounters with killer whales, sharks and turtles, you'll feel the enthusiasm, energy and excitement of all kinds of marine life. Discover a colorful village nestled among towering trees, explore a 3-story playland of climbing nets and tunnels, soar above the treetops on a zipline adventure or launch into the sky from inside a 35-foot (10-meter) waterfall. Ride one of the thrilling coasters like Cobra's Curse, Sheikra or Montu. Then, see a wide array of animals in their natural environment such as giraffes, elephants, cheetahs, tigers and more!